Picture the home (or homes) where you grew up. When was your neighborhood built? Did most people in your neighborhood own or rent their homes? What did your neighbors look like? Were there a lot of immigrants or your neighborhood? A visible transient population? Was there a lot of green space? What kind of businesses were around? Were their churches, synagogues, mosques, and/or other places of worship? What kinds of social services were available? Did you live near hospitals or government offices? Now, picture what that neighborhood must have been like nearly 100 years ago. For many people, the ethnic and religious makeup of their neighborhoods may have looked very different. Yet even the most diverse neighborhoods contain relics of the architectural, legal, and social actions that defined their demographics. 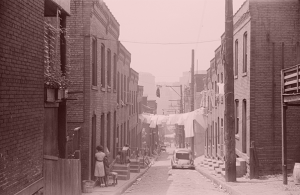 For the public scholars involved in the Mapping Inequality project, unveiling the financial, legal, and social structures in the creation of neighborhoods across the United States is a critical lens through which to study the history of American inequity. Mapping Inequality presents access to a national collection of “security” maps and area descriptions produced by the Home Owners’ Loan Corporation between 1935 and 1940. These interactive maps are representations of real maps that HOLC created by gathering data from mortgage lenders, developers, and real estate appraisers to create color-coded maps of credit worthiness and risk in metropolitan neighborhoods. This practice of redlining—refusing loans or insurance to homeowners based on their ethnic and/or racial identity—was a defining factor in the racial and financial makeup of American cities. The urban ghettos of Chicago’s West and South Sides, New York’s Chinatown and Little Italy, the Jewish populations of the Boston area’s Brookline neighborhood, and Skid Row in downtown Los Angeles are all examples of the ways that redlining shaped cities across the United States. There are currently 150 cities represented on Mapping Inequality’s map, and the website is constantly being added to and expanded. Mapping Inequality is a collaboration between three research teams: the University of Richmond’s Digital Scholarship Lab; University of Maryland professor Richard Marciano from the Digital Curation Innovation Center (DCIC) at the College of Information Studies (“Maryland’s iSchool”) with a team of students; and Virginia Tech History professor LaDale Winling and a team of students. Information on the website is built upon materials collected by an earlier $250K IMLS-funded grant (LG-05-06-0158-06) called T-RACES (Testbed for the Redlining Archives of California’s Exclusionary Spaces) with David Goldberg at UC Irvine and Chien-Yi Hou at UNC Chapel Hill; and a 2013 NSF/OCI Grant (0848296) called Cyberinfrastructure for Billions of Electronic Records (CI-BER), a cooperative agreement between NSF and NARA, with Cathy Davidson and Robert Calderbank at Duke. Additional website research and texts were created by N. D. B. Connolly, the Herbert Baxter Adams Associate Professor of History at the Johns Hopkins University.